A difficult task this one. As the euphoria and level of involvement with this course waxes and wanes, it is a complex task to actually sit down and summarise the last 12 weeks. On top of this is the busyness of work at this time of year and the need to wait for and then absorb the feedback on the previous assessment tasks. Then, there is the intimidation of seeing the highly creative and polished responses like Lisa’s movie, Bradley’s CMap construction and the Drexler production based on the Common Craft model. All different, all fantastic. So how do I follow my theme from throughout this course of attempting to apply the principles and learnings to my specific work situation? I decided on a version of a digital story with all its strengths and weaknesses. Like all assignments it helped me to crytallise what I had learnt from CCK08 and well as learning a new set of technology skills I didn’t have before. I created this in Adobe Photoshop Elements (v4.0) and exported it as a pdf. cck08_final_gc (please click at the end of each slide to advance). This concept map is entirely different from the first I tried and published. This time I’ve focused on an issue that has intrigued me for a while and I’ll try to relate it to the connectivism concepts we’ve covered in the last few months. In any case it was very enjoyable going back to cMaps a second time and leveraging off some of the concept maps I’ve seen in various CCK08 posts. In my work I get to introduce a lot of on-line methodologies and technologies to teachers. Too often the sessions happen in isolation and out of context. For example, I do a lot of workshops on finding digital resources via our corporate portal and search engine. The question then remains “So What? I’ve found this stuff – what do I do with it?” The context is so much bigger than the scope of the individual sessions. It’s often a real Catch 22 situation where it is hard to know where to start. The connections and sense making are not always made. in the pedagogy area – teachers will need to make decisions about knowledge, skills and attitudes as well as the approach eg teacher led? learner directed? or a combination of many methods to suit the circumstances. These decisions match the concepts of connectivism, the nature of knowledge and the issues of power & authority. in the resources area – what connections does the teacher make with their colleagues? with corporate systems? with their students? Does the teacher supply all of the resources for students to “learn” or does the teacher create a space eg a wiki, for a group of students to co-create a resource which answers a problem and then becomes available to the rest of the cohort? Could peer assessment be part of the process? in the repositories area – which networks are tapped into to give access to required resources? Or is it open slather and the students learn to sift what is important? in the deployment area – how open will the deployment be? Will the resources be of the CCK08 experiment type or locked behind usernames and passwords for only invitees to use? One of the overriding questions I’ve talked about throughout this course and also mentioned by George in his Wk 11 summary is: will these new educational technologies transform the way we teach or will they be tools to augment the existing paradigm? One simple answer is that teachers now have more tools available to them to make a greater range of choices and depending on the context, decide on what’s best for their students, themselves and their colleagues. When I first visited my physiotherapist, he was bending and stretching my leg in the way only physios can. He asked me to “relax” my leg and knee so that he could assess the range of movement. I thought I did, but he asked me several more times to relax. He then asked “are you a teacher”? When I replied “yes”, he said “we have the same problem with all you teachers – you need to be in control”. I wonder if this need to be in control is part of the reason for the resistance we feel when trying to adopt different approaches to teaching and learning? As mentioned in my paper #2 for this CCK08 course, the Australian Vocational Education & Training (VET) sector is now driven by a competitive funding agenda. Training institutions are increasingly funded on their ability to show outcomes based on the national curriculum, responsiveness to customer needs, flexibility and effective industry partnerships. This is a major shift. Like it or not many things have changed and teaching will need to change with it. f2f will remain the predominant delivery mechanism – the new teaching and learning approaches will need to happen in these spaces. Can change happen within in these spaces (Siemens2008)? Will teachers be willing to lose some of their control? there are early adopters of technology but a number of chasms have prevented the mainstream adoption of these innovations. 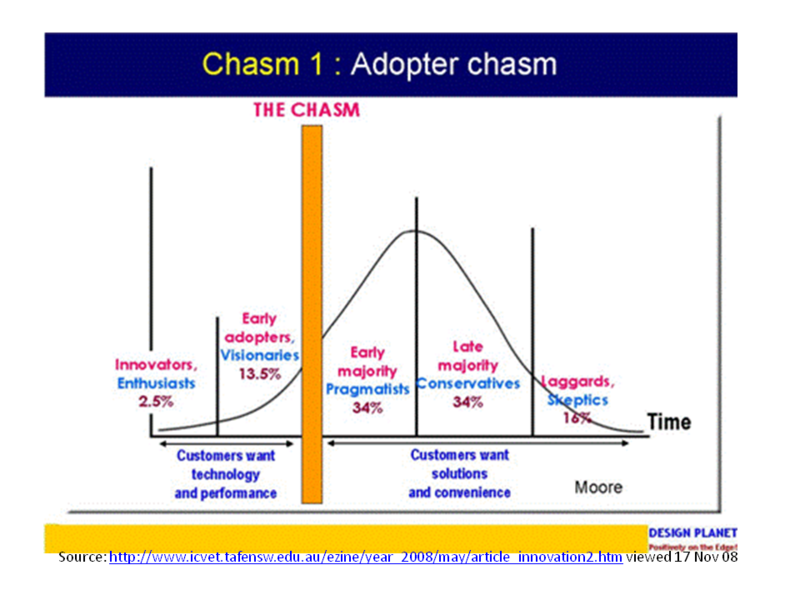 the technology – pedagogy chasm where the technology advances have outstripped the pedagogical. Jasinski tells us that “the best system to enable innovation to thrive is a complex system, which is adaptive, largely self-organised, networked and highly connected, where interactions are fluid and interdependent and there is flexibility to embrace both radical and incremental changes” (Executive Summary p3). Lots of links in this one quote to connectivism. The emphasis is on embedding the innovation i.e. making the change part of mainstream practice rather than introducing innovation. teachers are supporting others to introduce new technologies, there has been a considerable growth in mentor networks both formal and informal. an increasing amount of teaching is happening outside the classroom in blended formats and in the workplace. the pockets of early innovation are percolating through the ranks – often students are the catalysts when they see one teacher doing something “cool” then the others can be under pressure too. baby steps are important steps – one teacher I know is using wikis as a course management mechanism (much the same as the wiki for this CCK08 course). Students have access to course documents and lesson materials – important needs are being met and the teacher is freed up from admin tasks and can spend more time discussing the important things with students. The collaboration and other technologies will come next now that the ice has been broken. sometimes too much choice is a problem – one group of teachers I worked with told me: “stop giving us choices, just tell us what you want us to do”. The range of new technologies is sometimes overwhelming, many have become paralysed trying to decide. in many places there is no culture of sharing. This one gets to me – I and my direct colleagues have always shared ideas and resources – I really don’t know how I can assist to change this culture apart from constant “nagging”. was Stephen’s use of the “God switch” on the Moodle forum in Week 8 (thanks Bradley Shoebottom for the descriptor) any different to many of our practices in a f2f classroom? This course has proven we live in spaces with weak ties and easy connections. A number of my colleagues have stopped even lurking – they basically needed stronger (social) ties and fewer connections. All of this despite a deep felt interest in the aims of the course. I would agree with Lisa’s question about the concept of knowledge – is it the content that is important or is it the life long learning skills that now assume much greater importance? Different contexts will require different answers – a training course for triage nurses (strict processes) will look very different to a course for web designers (creativity) even though both require serious problem solving skills. This paper is written from the point of view of an educator in the Australian Vocational Education & Training (VET) sector. The Federal Government of Australia is pursuing a competitive funding agenda where training institutions will be funded on their ability to show responsiveness to customer needs, flexibility and effective industry partnerships. Web 2.0 technologies are used peripherally and we don’t yet have a lot of examples of the paradigm shift to learner generated content and all the other changes possible with Web 2.0 (see Siemens 2008a p.12). what will I teach? should be more about the skills of lifelong learning and employability skills rather than increasingly ephemeral content. How do I teach and encourage students to learn these skills through/despite prescribed and audited outcomes? how will I know the students learnt it? again the answer lies in what content/skills/attitudes are important and what types of evidence “prove” these competencies have been achieved? An increasing number of teachers are embracing new ways of delivering and assessing. “What I am seeing now is that almost every teacher I talk with is practising or in the process of implementing workplace learning and/or project-based and/or flexible or blended learning.” (V. Marchant, personal communication, October 22, 2008). With an ageing workforce often battered by constant change, “…. educators, when they are lacking in confidence about new delivery methods, tend to retreat to their comfort zone, which for most is face-to-face, lock-step teaching. It’s a known quantity, it’s predictable in its results and the teacher feels in control of what’s happening.” (B. Thurlow, personal communication, October 22, 2008). However, the system and its infrastructure can conspire to thwart the tide of change. “…. lots of resistance related to systems that won’t support the adapters and disincentives from management to get involved.” (A. Bowden personal communication, October 22, 2008). Siemens (2008b) suggests “New technologies are not necessarily replace existing approaches; instead, they are enlarging the range of options for learners”. These options, for both learners and facilitators, can impact on how we teach (the learning spaces and their ecologies) and how we assess. Teachers are big on denial and avoidance. Many are hoping this technology stuff will go away or remain in the background until they retire. It may take a “cataclysmic externally-imposed change that will sweep away the old order..” (Martin Stewart-Weeks in response to Connell 2008). Perhaps the Australian Federal Government agenda will provide that impetus -like it or not. 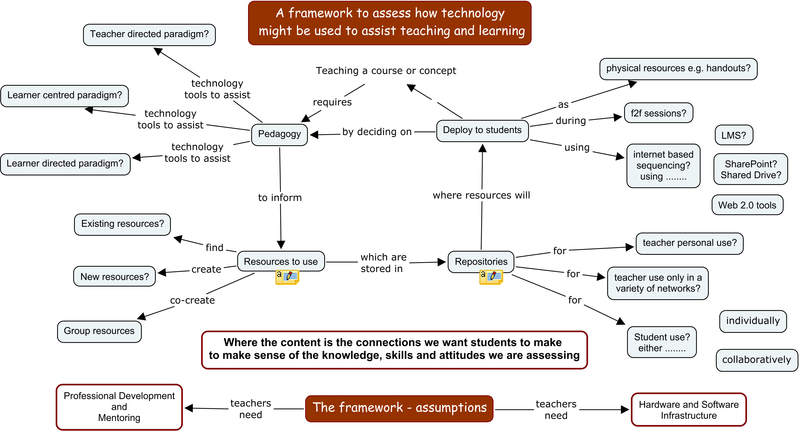 teachers think critically about their pedagogy and the way they use technology to fit their context. Downes (2008) asked “it would appear that web 2.0 is the salvation of education. 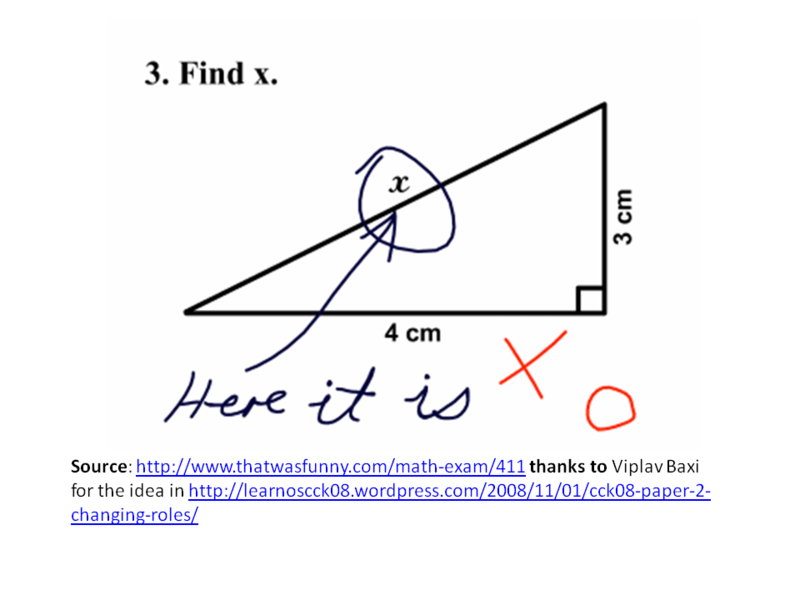 But what are we basing that on?” What technologies could assist in determining what is “X”? Smith and Blake (2005) challenge teachers to facilitate learning by creating an environment which emphasises the employability skills needed in industry such as problem solving, communication, collaboration and team work. Don’t tell the group what is “X”, rather pose a range of strategic questions and problems to determine more about “X”. teaching presence: where the facilitator creates an environment supportive of these interactions and providing direct instruction when necessary. The more the learner is engaged with the content, with the teacher as the “guide on the side”, the more learning occurs. Don’t know what to say this week. The flood of emails created a range of emotions for me. There was a certain voyeuristic pleasure in following the responses whether humourous or vitriolic. Listening now to the recording of the Elluminate session I’m now trying to recall what similar power plays I have pulled over the years – sometimes unconsciously. 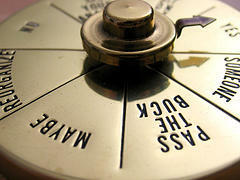 Then Lisa again provoked my interest in another thoughtful post about control by personality. The closest I came was to look at how my expectations, demeanor and yeah my teaching style changes depending on the audience. I would readily adopt micro management techniques with mostly teenage students and very communicative and collaborative approaches with adult learners of English as a Second Language. Both seemed relatively successful according to feedback. 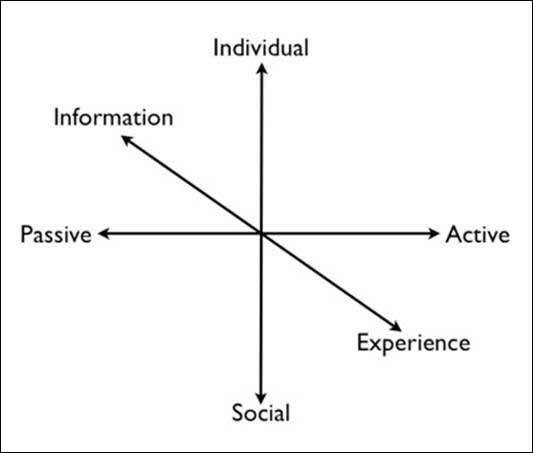 Wendy, in the Moodle Forum, called this “structure. Regardless, the power over a student’s ability to progress further or not was never far from the surface. In the online environment the ability to rely on “personality” is more difficult as spoken words look very different on paper and out of context. Wonder at the meaning of instructional design! At our workplace it means very talented people who have both technical and educational skills who produce complex multimedia resources for others (this also requires high level project management skills). George’s presentation implies instructional design is more akin to teachers planning lessons and courses. Wonder if there’s a cultural difference here – an Aussie thing? It again highlights for me the importance of assumptions around terminology. I enjoyed Wendy’s summary of the the Grainne Conole papers. I was interested in her questions related to the desire to move students from one quadrant to another in Grainne’s Pedagogy framework (Conole, figure 1). Does this assume learning most effectively takes place in the bottom right hand corner? In another piece supplied by a colleague, (MY) Three Principles of Effective Online Pedagogy, Bill Pelz emphasises the importance of the learner being at the centre of the learning process. The more the learner is engaged with the content, with the teacher as the “guide on the side”, the more learning occurs. His three principles very clearly mirror Stephen and George’s notion that learning is about making connections. Pelz structures his “teaching” around allowing students to make as many connections as possible to allow collaboration and problem solving to give them control over their own learning. Found this week harder to get into -subject matter less obvious. Noted a big drop in the discussion happening in Moodle, perhaps lots of people also worn out from last week’s vigorous discussion on Networks which was certainly passionate and sometimes unreasonable. I’ve attempted to understand chaos theory some time ago, it left me cold then as well. However, this time I probably have the beginnings of some insight thanks to the parenting analogy outlined by Renata Phelps (p.6). What I’m trying to get a handle on is how any of this will impact on the upcoming “changing role of the educator”. Phelps’ article really sparked some more thoughts on how the whole paradigm of teaching must change as a result of the non linear opportunities presented by the new technologies. Perhaps another analogy to help understand the nature of complexity is via the current global financial crisis. As stocks gyrate wildly from day to day there can’t be any Newtonian clock work mechanism in place here. The complexities surrounding the mood and emotion are immense as well as the distinct lack of reason or consideration of the so called fundamentals. Each news item or announcement from a government officer is greeted with either the expected reaction for example, a drop in interest rates helps to raise stock prices. Or the announcement is greeted by an unexpected reaction – the drop in interest rates pushes stock prices further down because the market now suspects the government is really worried about something. In one of the readings this week (apologies for not sourcing this – I can’t remember where I read it) the author outlined the incredible complexity of each classroom. In a place where each person acts in response to the teacher and the content as well as all the other things going on in their lives, there must be complexity. So much for lesson plans.